You just can’t seem to get ahead. No matter how hard you work, you never seem to have as much money as you need, and you’re wondering how on earth you could ever become rich. 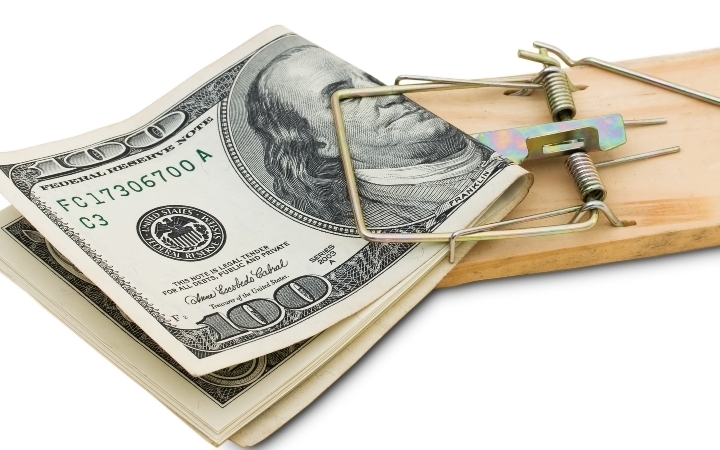 There’s a chance you may be falling into one (or more) of these 6 traps that can sabotage even the best money management plans. Debt is one of the biggest drains on financial success. It’s very easy to get into debt, and once you’ve got it, it can take decades of your life to pay off. No purchase is worth spending the rest of your life paying it down. Do everything in your power to avoid being in debt and if you are in one, do everything to pay them down. Rather than going into debt to pay for a grand ceremony make the trade-off. Maybe you need to skip celebrating your birthday or wedding this year. It’s impossible to become financially successful without a budget. Budgeting is money management 101, and without it, you won’t have any solid idea where your money is going—and where you might be wasting it. Sit down today and figure out all of your monthly expenses, then take a long, hard look at them to determine which expenses can be trimmed or even cut. Once you’ve got a solid budget worked out, track your spending to make sure you’re sticking to it. Saving for the future is essential. You should have approximately 3-6 months’ worth of income saved up in case of emergencies, and you should also consistently be putting money aside for long-term goals like retirement, your children’s education, or putting a down payment on a home. If you don’t save for these things now, you could find yourself taking on debt in the future in order to finance them. Do you buy things on impulse? Grocery shop without a list? Give into sales pressure even if you don’t technically need something? All of these things will chip away at your ability to build positive net worth. Learn to discern whether something is a want or a need, and to comparison shop for items you do need. Whenever possible, put big items on a 30-day “wait list” to make sure you’re not giving into impulse, and to track any potential sales to see if you can get them cheaper. Raises and promotions won’t do you much good if you turn around and spend that extra money on a bigger, pricier lifestyle. Rather than seeing extra income as an excuse to spend, try to put it to use by investing it or adding it to one of your savings goals. If you don’t have proper insurance coverage you’re playing a risky game with your money. Spending a little money on monthly payments now is more than worth it in the event the unexpected happens. Make sure you’ve got adequate coverage when it comes to health insurance, life insurance, automobile insurance and renter’s or homeowner’s insurance.